Manohar Parrikar, who rose from a Pracharak of the Rashtriya Swayamsevak Sangh (RSS) to become the country's Defence Minister and also chief minister of Goa, enjo yed a man-next-door image in the politically-volatile coastal state of Goa. 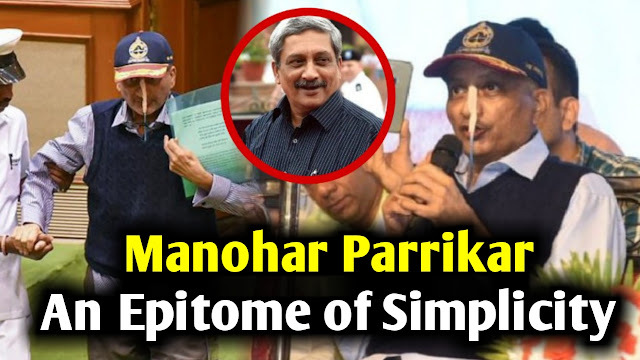 Parrikar, 63, served the state three times as chief minister and had a three-year-long stint as Defence Minister in the Narendra Modi-led cabinet. Born on December 13, 1955 into a middle-class family in Mapusa, his political career began as an RSS pracharak and he continued working for the Sangh even after graduating from IIT-Bombay as a metallurgical engineer. Parrikar never shied away from displaying his affiliation to the Sangh and was even photographed participating in the annual 'Sanchalan' organised by the RSS in the uniform and wielding lathi. He became an MLA in 1994 and was the Leader of Opposition in the Goa Assembly from June to November 1999. He was the first alumni of one of the top engineering institutes of India to become an MLA. He became chief minister of Goa for the first time on October 24, 2000, but his tenure lasted only until February 27, 2002. On June 5, 2002, he was re-elected and served another term as chief minister. On January 29, 2005, his government was reduced to a minority in the assembly after four BJP MLAs resigned from the House. Pratapsinh Rane of the Congress subsequently replaced Parrikar as chief minister. In 2007, the Parrikar-led BJP was defeated by the Congress-led by Digambar Kamat. But the year 2012 saw Parrikar riding a popularity wave in the state when he took his party to the historic number of 21 out of 40 seats in the assembly. He went on to become the chief minister again. BJP continued its victory mark in the year 2014 when the party won both the Lok Sabha seats. After the Modi-led Cabinet was sworn at the Centre, Parrikar was offered a ministerial berth in November 2014. He remained in the union cabinet till 2017 when his party failed to garner a majority in the Goa legislative assembly polls. When he was the Defence Minister, Manohar Parrikar prefered to use once ubiquitous ambassador car in Delhi in the era of SUVs. Parrikar also felt "jittery" when surrounded by security personnel who are part of his entourage. Recounting his days as Goa chief minister, Parrikar had then said he preferred to stay simple by choice. "Even after becoming Defence minister, I travel in an ambassador (car) in New Delhi whose doors get jammed from time to time and even the car breaks down thrice a day. But, simplicity is my comfort and I prefer to remain simple by choice. I get jittery when there are policemen surrounding me (for security)," the minister had said. One of the best news site.